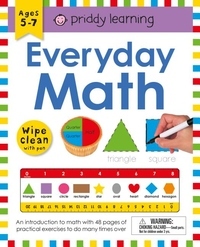 Help your child to learn the math they'll use in everyday life with this wipe-clean workbook. Through everyday activities, such as going to the store, children will learn first math skills, including weight, money, measurement, and fractions. Included with the book is a special pen, and the wipe-clean pages enable children to practice over and over again until they have mastered each skill. With bright photographic images to engage and encourage, this early-learning workbook will support your child during their early school years.